I love subaltern resistance and political philosophy. I also enjoy literature, music, films, pure adda and humour. I work on Naxalite movement,Marxism, poststructuralism, postmodernism, Derridean Deconstruction, postcolonialism. 2. New Social Issues such as caste, tribe, human rights, ecology, gender , migration, stateless citizens, political society, civil society, child labour, migrants, LGBT, etc. I presented a paper entitled, ‘Conflict in Indian Marxism: Critique of Naxalism in Postcolonial Perspective’ at the Conflict Research Society’s 50th Anniversary Conference held at the University of Essex, United Kingdom, on 17th September 2013 and attended the conference from 16th September to 19th September 2013. I was born in 1957 in Kolkata. In school I was a student of Science stream and after H.S. Examination (1973) I started to study Science which i left unfinished and finally completed Political Science Honours. In the meanwhile, I got actively involved in Naxalite politics during 1974-1981. But gradually, I grew critical of Naxalism and orthodox Marxism and became interested in Western Marxism, Gramsci, Althusser, Frankfurt School, and over time I further moved towards post-structuralism, especially Foucault and Derrida, postmodernism, postcolonialism and feminism. Finally, I began to believe in a possible dialogue between Naxalism/ Marxism on the one hand , and post-structuralism, postmodernism, postcolonialism and feminism, on the other. In a similar vein I am interested in a dialogue between Class struggle on the one hand and New Social Movements (NSM) on the other. From 1984 Research Scholar for Ph.D. at CSSSC for 1 year. Topic: Naxalite Theory. Doctoral Teacher Fellow of ICSSR (1988 –1991). Topic: Maoism in West Bengal. Ph.D. awarded in 1996 (University of Calcutta; Supervisor: Dr. Partha Chatterjee). Minor Research Project of UGC (2008-2010) on Derrida’s Deconstruction. From 1985 for nearly 2 years Guest Lecturer in Kalyani University. During 1985-2012, taught Political Science in Scottish Church College (Calcutta University). During 2010- 2012, Guest Lecturer in Philosophy, Calcutta University. From 2010-2014 Guest Lecturer in Political Science, Calcutta University. Joined Presidency University in June 2012. GENERALLY, Naxalite movement, poststructuralism, Derridean Deconstruction, postcolonialism. (b) critique of Naxalism in the perspectives of New Social Issues such as caste, tribe,human rights,ecology,gender,migration,stateless citizens,political society,civil society, child labour, migrants, LGBT, etc. At present , I am authoring a book entitled, Derrida's Deconstruction: Political Implications, on the basis of my already finished Minor Research Project of the UGC. I supervised a Ph.D. research (University of Calcutta) on ‘Charu Majumder, the Naxalite Leader: the Role of the Individual in History – A Critical Evaluation’. PhD was awarded in 2018. Now I supervise three Ph.D. researches (Presidency University) - one on 'Postcolonial Critique of Naxalism' , one on 'Policy towards Care Labourer' and the other on 'Political Orientation of Working Women'. I am interested to supervise research on Naxalism, poststructuralism, postcolonialism, Gramscian Marxism, Colonial Modernity, and Leftist movements in India etc. 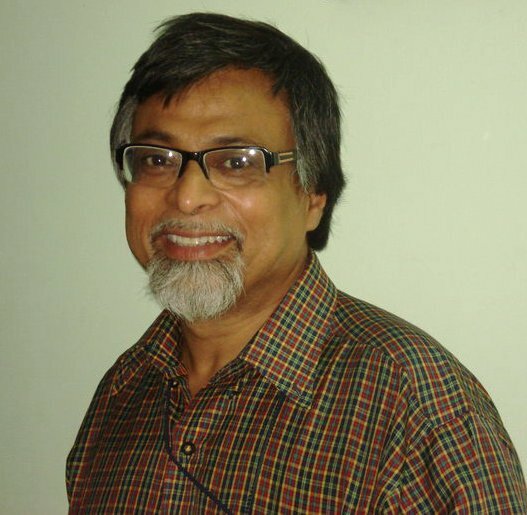 I am the Founder & former Chief Editor, Journal of Humanities and Social Sciences, ISSN 0973-8738, a refereed academic journal (Estd.2003) annually published by the Scottish Church College [University of Calcutta]; after joining Presidency University, I continue as the Founder-Editor of this journal. Its Advisory Board includes: Amartya Sen, Ashis Nandy, Partha Chatterjee, Gayatri Chakravorty Spivak, Dipesh Chakrabarty, Amiya Bagchi, Shefali Moitra, Manas Ray, Alok Ray, Ramkrishna Bhattacharya, Binay Bhushan Chaudhuri, Sobhanlal Datta Gupta,Suranjan Das, Dipak Das. I was the Founder-Convenor of SAMAJ-O-CHINTA, an academic seminar society of Kolkata which conducted monthly seminars in Bangla from 1991 to 2006. 1. Naxalbari-r Purbakshan: Kichhu Postmodern Bhabna (Kolkata: Progressive Publishers), 1998 (Bengali).ISBN 81-86383-59-X ; Reprint 2012. 2. Towards Naxalbari (1953 -- 1967) (Kolkata: Progressive Publishers), 2000. ISBN 81-86383-76-X; Reprint 2012. (Ed.) Discourses on Naxalite Movement (1967-2009) (Kolkata: Setu Prakashani), 2010 [consists of 33 original research papers contributed by foreign and Indian scholars]. ISBN 978-93-80677-00-2. (Ed.) Avenel Companion to Modern Social Theorists (Avenel) 2011[consists of 26 original research papers contributed by foreign and Indian scholars]. ISBN 978-93-80761-14-5. (Ed.) Political Sociology, Setu Prakashani, Kolkata & New Delhi, 2015. (Ed.) Social Theorists of Modern Times, Setu Prakashani, Kolkata & New Delhi, 2015. ‘Prelude to Postcolonial Awareness: Krishnachandra Bhattacharyya’s ‘Swaraj in Ideas’ in Bakshi, S. Sengupta, S. Paul (ed. ), Anxieties, Influences and After: Critical Responses to Postcolonialism and Neo-Colonialism, Worldview, New Delhi, 2008. Occasional Paper: ‘Governance & Naxalism’ published by the Department of Political Science,University of Calcutta,UGC,DRS(Phase II),2012. ‘Bentham’s Utilitarian Ethics: Postmodern Review’ in M. Jahan & P. Bhattacharya (ed. ), Some Essays on Utilitarianism, published by the Department of Philosophy, University of Calcutta, Kolkata, 2012. 'Greek Political Thought: Some Postmodern Observations' in Alochona Chakra, 34 (January 2013), [in Bengali]. 'Swami Vivekananda: Spiritual Nationalism and Doctrine of the State' [in Bengali] in Bharatiya Rashtra Chinta Parichay edited by Ashok Kumar Mukhopadhyay, Kolkata: Paschimbanga Rajya Pustak Parshat, October 2013. 'Postmodernism and Political Sociology' in P. Basu (Ed.) Political Sociology, Setu Prakashani, Kolkata & New Delhi, 2016. 'Foucault's Prison Principles and the Colonial Indian Prison System' in K. Jaishankar, T. Mukherjee, P. Bharadwaj, M. Desai Asher (Ed), Indian Prisons, New Delhi: Atlantic, 2014. 'Naxaliism and Imperialism', Palgrave Encyclopedia of Imperialism and Revolution.London: Palgrave, 2016.